Abandoned cars in an abandoned quarry. If that headline sounds familiar it’s likely because we published an article with this exact same title in October of 2013. Surprisingly, there is a second disaffected quarry located about 30 miles north of the first one that is also home to a handful of decrepit classics. We looked for background information and we couldn’t find a link between the two quarries. They weren’t owned by the same company and they shut down at completely different times, so finding cars in both is a completely random occurrence that – we guess – illustrates peoples’ need for a discreet place to get rid of stolen cars. Walking from what used to be the east entrance of the quarry, the first car that we saw was a 2CV painted in a bright shade of a yellow called Jaune Cédrat, a color only offered on the stripped-down 2CV Spécial that was built from 1975 to 1978. The 2CV was pushed down a cliff so it is badly mangled, but a closer look revealed it was largely complete save for the engine and the transmission when it was disposed of. All of these cars were likely stolen but, interestingly, most still had at least one license plate. The 2CV’s GD 13 registration number indicates it was built in 1976. An equally crushed Talbot Samba was sitting just a few yards away from the 2CV. This one still had all major drivetrain components but both license plates had been removed and the interior was mostly stripped. It was also pushed down the cliff which explains why it looks like an early prototype for the smart fortwo. 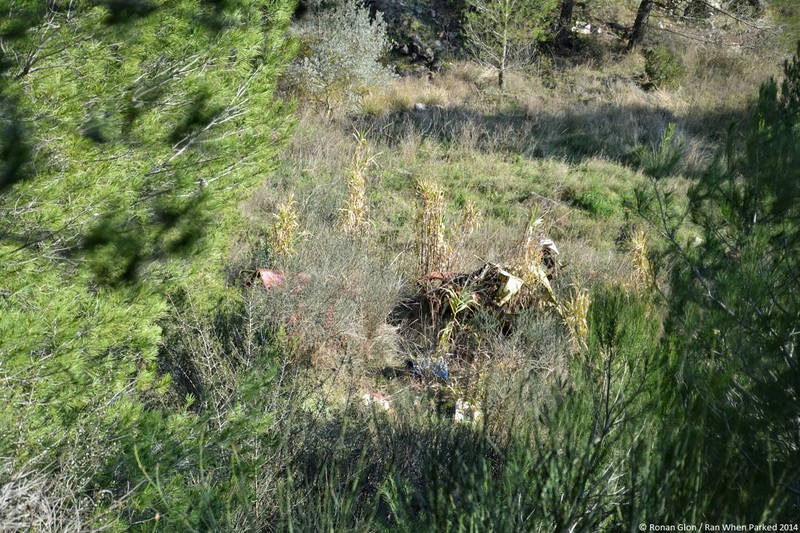 A white hatch from a Renault 5 was not far from the Samba and we found the rest of it by looking up, literally – it ended its fall on a ledge located about halfway up the cliff. The ID plate in the engine bay indicates the 5 was built in 1980, meaning that the JK 13 registration number on the hatch is original. The 5 is the worst car of the lot: in addition to being totally stripped, it has also been crushed by huge boulders. The fourth and final car caught our eye belly up on the same ledge as the 5. More climbing revealed that it’s a Citroën Dyane that was first registered on the outskirts of Paris in 1968, meaning that it was built during the second year of production. Like the Samba, the Dyane is still fitted with most of its mechanical components but we evidently couldn’t get a good look at the interior. There were plenty of seemingly random car and motorcycle parts scattered across the quarry but we looked high and low (again, literally) and we didn’t find any other vehicles, leading us to conclude that the parts were simply tossed down the cliff. This place is impossible to access in even a relatively rugged car like a Renault 4 so we can’t imagine that a tow truck somehow squeezed in there and towed a few cars out. Also, the cars in the first quarry are in plain sight and easily accessible by anyone, the quarry is essentially at the far end of a public park. The ones pictured below are located a couple of hundred yards away from the nearest road and there is absolutely nothing around – the odds of simply stumbling upon them or even spotting them from a distance are extremely low. Tags: Citroen, Citroen 2CV, Citroen Dyane, Renault, Renault 5, Talbot, Talbot Samba. Bookmark the permalink. Previous post ← Open mic: What classic car should still be in production today?